Jennifer Kent’s directorial debut, The Babadook, is a horror tale uncommon in its shattering poignancy. Bearing the influence of Guy de Maupassant’s The Horla, as well as the creepy ambience of J-Horror (Hideo Nakata’s Dark Water, especially), the film is fronted by Essie Davis’s electric performance. Quite brilliantly, Kent’s haunted house chiller has managed the neat trick of packing a mighty emotional punch and providing de rigueur scare-jolts. One day, single mum Amelia (Davis) and her boy, Samuel (Noah Wiseman), find a creepy pop-up storybook titled ‘Mister Babadook’. Something isn’t quite right about this mysterious tome. (Imagine a collaboration between Maurice Sendak and Michael Myers.) Not long after the discovery, things start to go bump in the night. Samuel is convinced his mum has let ‘Mister Babadook’ into the house and the spirit wants them both dead. Read between the lines. There are plenty of verbal and visual clues. What is in fact happening to Amelia and Samuel is far more horrifying and grounded than any outlandish ghostly goings-on. It’s what makes Kent’s debut feature film so damn good. Psychological torment and past traumas resurfacing to cause fresh havoc are benchmarks of horror cinema, but specifically, they are very strong lynchpins and contexts in Asian horror. The atmosphere of The Babadook, its lingering air of sadness, is more J-Horror than suffused with gothic terror. The influence of de Maupassant’s classic tale of madness is present in the film’s title. The Babadook, very much like The Horla, sounds like an Edward Lear or Lewis Carroll coined neologism. Both stories are focused, too, on an unintended action: a malevolent spirit unwittingly invited into the home. Kent goes further with the association. In a second act scene, Amelia, by now in the wicked grip of ‘Mister Babadook’ (read: mental illness), watches Mario Bava’s Black Sabbath (1963) on her television set. Flashes from the ‘Drop of Water’ segment (loosely inspired by de Maupassant’s work) prove that Kent has explicitly connected the dots and a lineage of influence has been established. 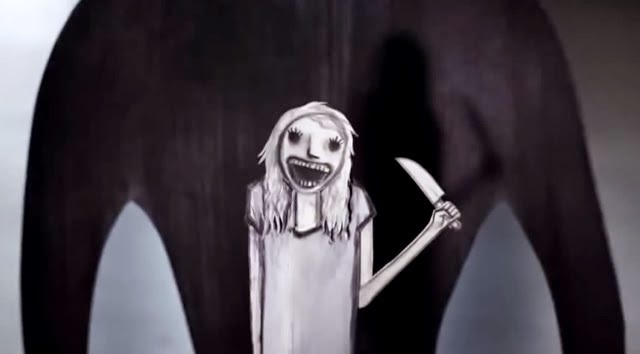 The Babadook should be regarded as an instant classic. There is no two ways about it. Taking a classical ghost story narrative and reworking it with sympathetic characters and a heart-wrenching subtext, Essie Davis’s portrayal of a mother suffering a psychotic breakdown twins Jack Nicholson’s unhinged role in The Shining with the melancholic fragility of Amy Seimetz’s troubled alcoholic in A Horrible Way to Die. It is a sensational performance befitting a sensational debut.